The origin of the red deer can be traced to western China where four different sub-species developed. The French, Persians and Romans practiced deer husbandry as early as the first century B.C., and France and England documented the mushrooming of the red deer population during that time period. Farming red deer for the production of velvet has been popular in China, Russia, and other eastern countries for 2,000 years. New Zealand revived interest in deer farming about 25 years ago when the wild red deer increased in number until they were considered pests. Since then, New Zealand has been very successful in improving genetics in breeding stock, producing and exporting venison and velvet and promoting hunting. The general color of all sub-species of the European red deer is a rich reddish brown in summer turning to a grayish brown in winter. The rump patch is a lighter brown and there may be a dark dorsal stripe. Red deer calves are spotted at birth, but these fade away after a few months. Prior to the rut, stags develop a mane as the neck swells. Red deer hinds weigh about 175 pounds. 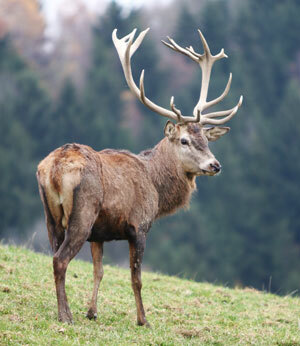 Red deer tolerate all ranges of weather and have a low susceptibility to disease. They have a high fertility rate and calve easily. They are calm herd animals and easy to transport. Since red deer are efficient converters of pasture to protein, with proper management they can be raised on marginal land and still yield high quality venison, velvet and by-products. Although red deer enjoy browsing, they are also grazers and do excellently on native and improved pastures. They prefer legumes like alfalfa and clover, but they thrive on a variety of grasses. Unlike cattle, red deer can graze on alfalfa with little risk of bloat. In the winter they do well on rye, oats, corn silage and wheat. Red deer are gently on pasture and can be stocked at a ratio of four to seven deer per acre. Red deer are disease and stress resistant. However, if they are poorly managed they are subject to the same diseases as traditional livestock such as tuberculosis, Brucellosis, and johns diseases. If stressed, red deer calves are susceptible to yersiniosis. Although red deer are disease resistant, it is extremely important to check the history and health status of the deer before they are bought. Red deer have seasonal synchronization of birth, body growth, activity cycles and growth stasis corresponding to feed quantity, quality and availability. For example, maximum nutritional demands for females occurs during lactation. The precise timing of breeding and birthing ensures that maximal lactational demands coincide with the most lush and plentiful growth of forage. (May, June and July in the northern hemisphere). Summer is the time of birth and lactation, and the time of maximum weight gain for yearlings. For the mature stags, it is the time for antler growth and regaining of body condition and fat reserves which were depleted during the previous autumn rut and winter. Red deer are single birth mammals (twins are very rare), giving birth after a gestation of approximately 234 days, beginning in early May through the summer. Red deer hinds can begin reproducing at 16 months; stags are ready to mate at 24-30 months of age. The rut, or male mating peak, begins in mid-September or early October, depending on the region and climate. Stags can reproduce for 14-20 years with a conception rate close to 90% or better. The ratio of stags to hinds depends on the age of the stag. Generally a two-year-old stag can breed up to twenty hinds, a three-year-old up to thirty, a four-year-old up to forty, and mature sires can cover as many as fifty or more dams. However, a sire should not be introduced to too many females or his velvet development will suffer.